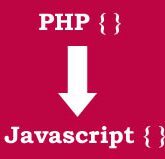 Inserting data from one server to another running PHP. There is a simple way to accomplish the above mentioned process i.e, webservices. The logic behind a web service is very simple. A web service could be implemented by the exchange of data between a server and a client, using SOAP, XML or JSON.